It’s almost Christmas but the pace at AOM is not letting up. 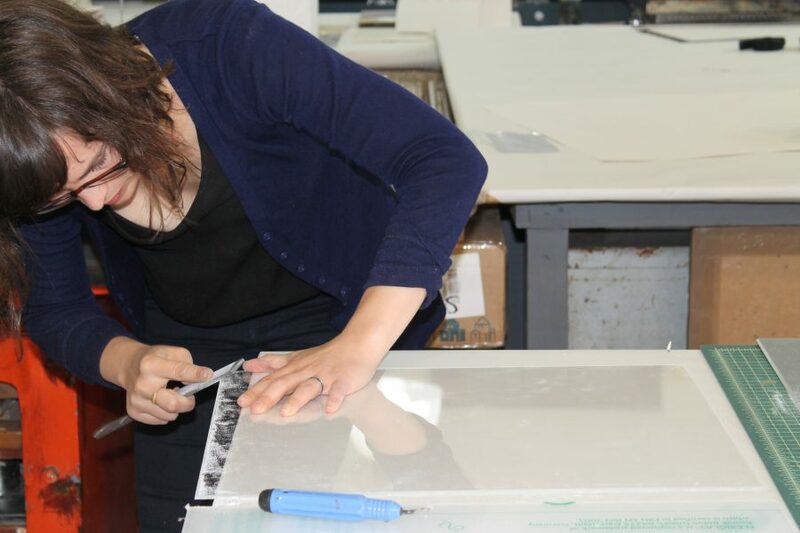 Master printer Jillian Ross is back in the workshop after a trip to the Editions/Artists Book Fair in NYC, and the printers are poised for a hard day’s work. The space is pumping with energy. 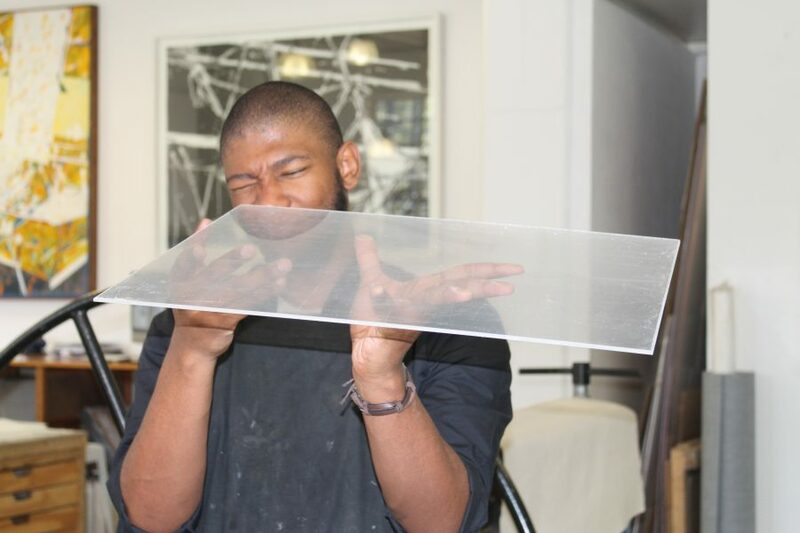 Jillian is cutting Perspex with the help of Kim-Lee Loggenberg, Sbongiseni Khulu and Neo Mahlasela in preparation for a set of nine watercolour monotypes by Luis Alonzo-Barkigia, a Mexican-born artist now living between New York and Johannesburg. 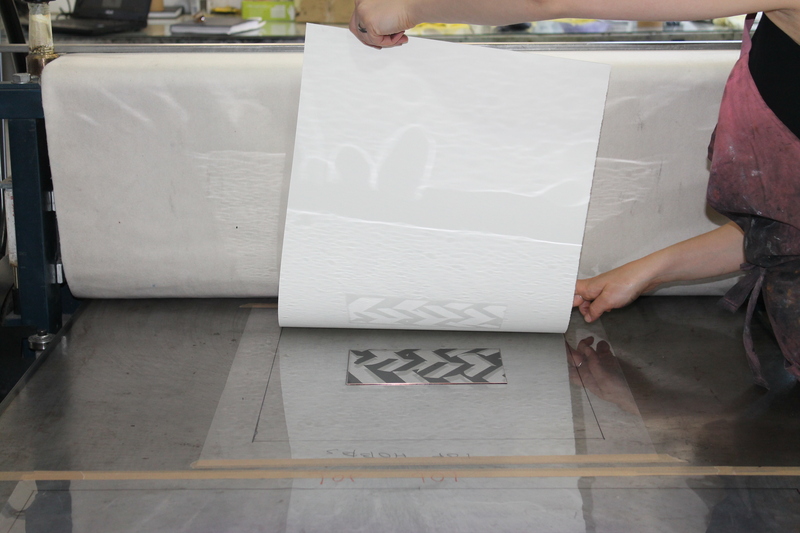 The printers bevel the sides of the Perspex plates in order to soften the edges, which might otherwise rip through the blankets and the fibres of the paper when put through the press. Sbongiseni double checks his bevelled edges. Neo takes no risks: donning his apron, protective glasses and a characteristically funky hat, he is ready to bevel. Adding to the buzz, Alonzo-Barkigia strides in to collect the Perspex plates and does a test run. 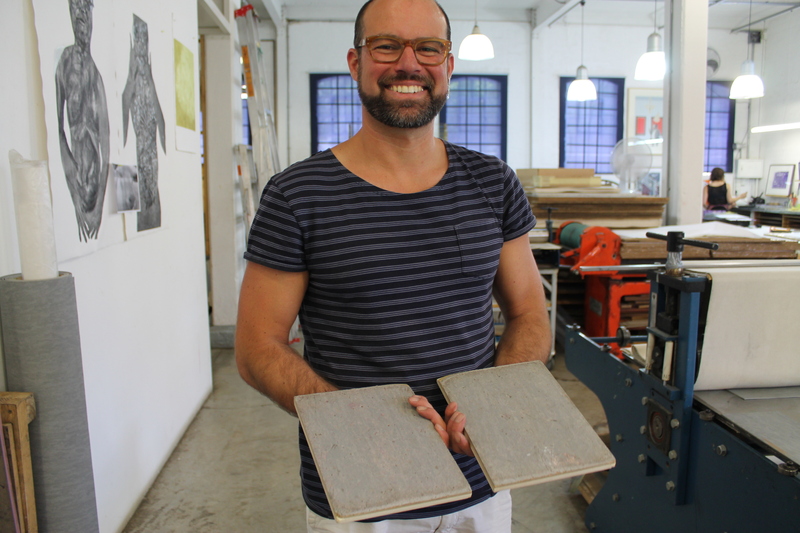 “I’m keen to see how different types of water-based inks and mark-making techniques imprint from the plate to the print”, he says with excitement and a hint of nervousness. 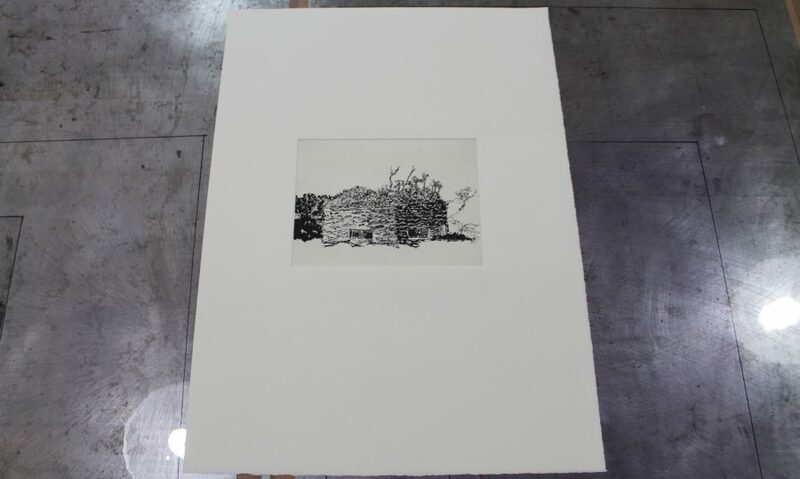 “I haven’t printed since 2002”, he admits, “and even then, I did woodcuts and aquatints. This is new terrain for me.” In light of the loose and colourful nature of his collage drawings, Alonzo-Barkigia decided to create a set of watercolour monotypes under Jillian’s guidance that working in this alternative medium will push and develop his practice. For making the monotypes, Alonzo-Barkigia will work with a common theme that runs through his work: the navigating of new spaces through the eye of an outsider. 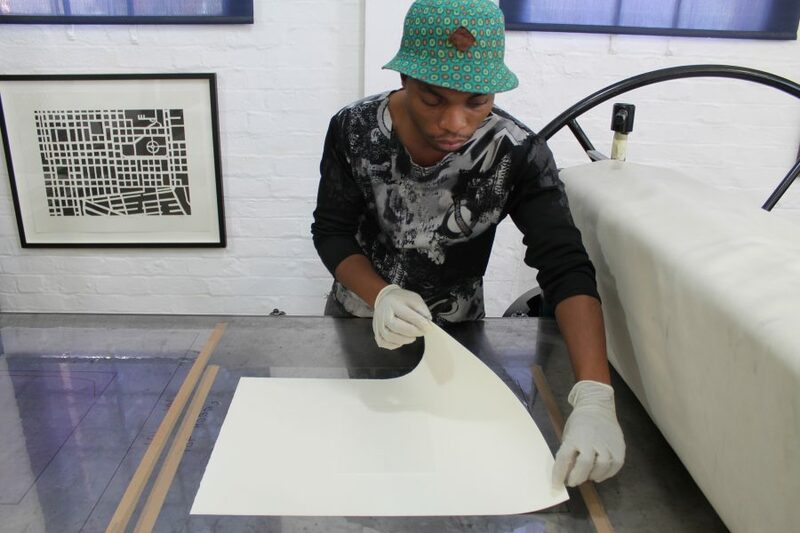 The monotypes will be executed on a solo road trip between Cape Town and Johannesburg in the upcoming weeks. They will go through the printing press at the end of his journey at our AOM workshop. Alonzo-Barkigia’s self-set variables are straight-forward: nine 40 x 50 cm plates and six days to document his travels from A to B. Although, he stresses that “it is more about the journey than the destination”. Along with making the prints, the artist will take photographs, documenting his journey through a myriad – or rather, a “collaging” – of means. Alonzo-Barkigia: “My interest in landscapes comes down to the solitude factor – the heightened zen feeling I get when forced to observe my surroundings. Landscape drawing is a form of meditation for me.” Sounding like a pure Romantic, he added that “there’s something totally sublime about nature.” Alonzo-Barkigia is less interested in documenting his social interactions along the way as he sees this as a distraction from his creative, self-navigating purpose. How might he execute the prints? Alonzo-Barkigia tells me that he recently visited the Scottish National Gallery where he felt inspired by watercolour works by Arthur Melville. While Alonzo-Barkigia sees his work as more abstract than Melville’s, which tend towards the figurative, he was drawn to Melville’s ability to construct an image using minimal brushstrokes. Author Melville is widely regarded as a progressive, pioneering master of the watercolour medium. 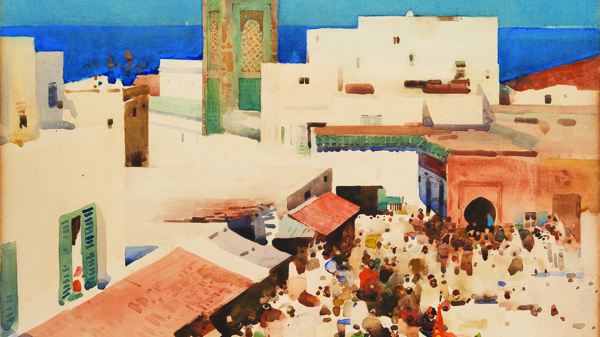 This 86 x 61 cm watercolour on paper is a depiction of a bustling market scene in Tangier. Alonzo-Barkigia was struck by Melville’s use of watercolour but prefers to make work with “an insinuation of something rather than the depiction of it”. The team gather round to observe the results. Alonzo-Barkigia notes the marks that are beautifully washy and points to areas which are undesirably muddy. Jillian explains that muddiness, in this instance, can come from layering too many colours on top of each other. She advises him to be strategic with his use of colour. Close-up of the test plate for Alonzo-Barkigia’s watercolour monotype suite. 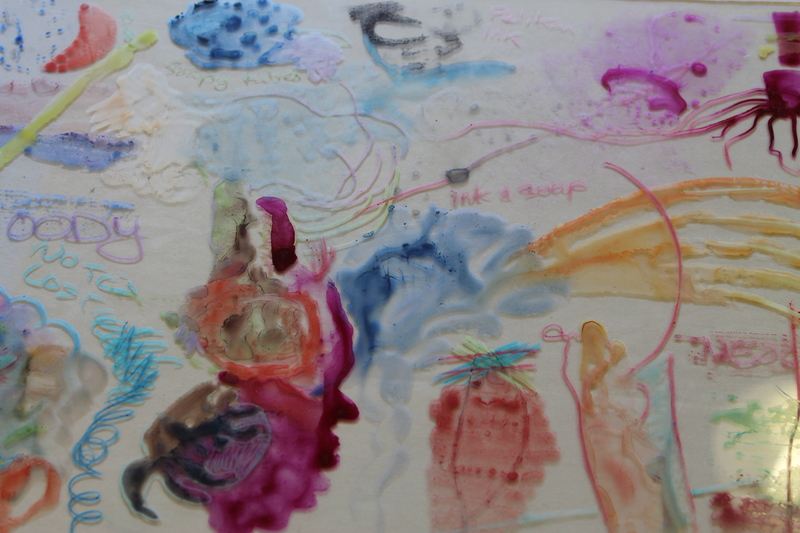 The artist used his fingers and paper towel to apply and spread the ink in areas. 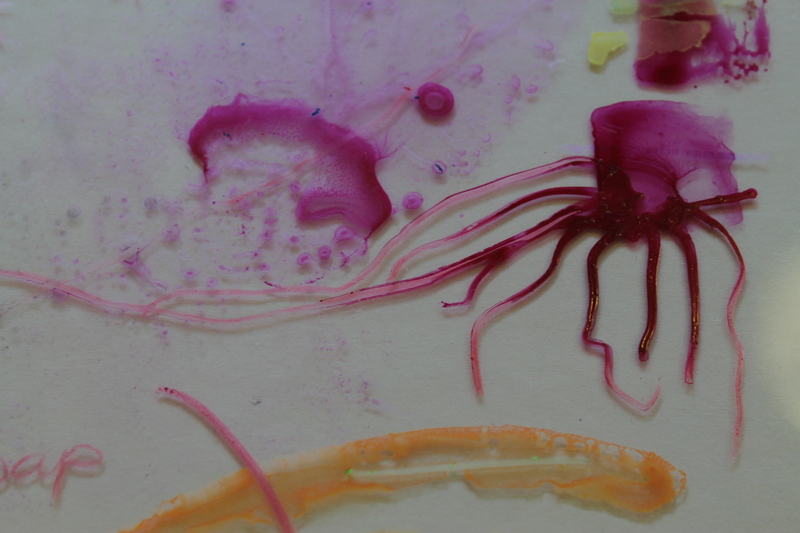 When making the test plate, Alonzo-Barkigia experimented with different types of inks and Woody crayons. He also used dishwashing soap to dilute the colours and create unique marks where bubbles formed and popped on the plate’s surface. On close inspection, this effect can be seen in this photo of one corner of the plate. Cape Town – Prince Albert – Knysna – Port Elizabeth – Graaf-Reinet – Nieu-Bethesda – Grahamstown – Underberg – Harrismith – Johannesburg. The artist’s bold and innovative attitude towards travel is reflected in his approach to making art. 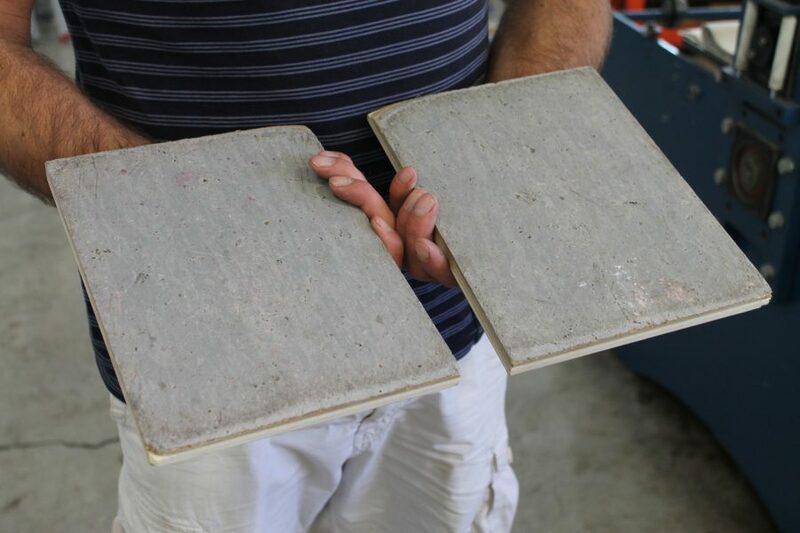 Before heading off, he hands over two lino plates marked with hundreds of tiny scratches and indentations. Alonzo-Barkigia: “I’m very curious to see the results.” So are we – stay tuned and all will be revealed on his return to AOM in a couple weeks. It is worth noting that Alonzo-Barkigia is currently exhibiting mixed media works at Hazard Gallery in AOM. The solo show, titled Brou-ha-ha, is displayed alongside abstract and colourful sculptures and paintings by Sophia van Wyk. On entering the gallery, the defining piece of Brou-ha-ha – a collage drawing of epic proportions – smacks the viewer square in the face, demanding haphazard visual engagement as it towers above you with images dotted in every direction. 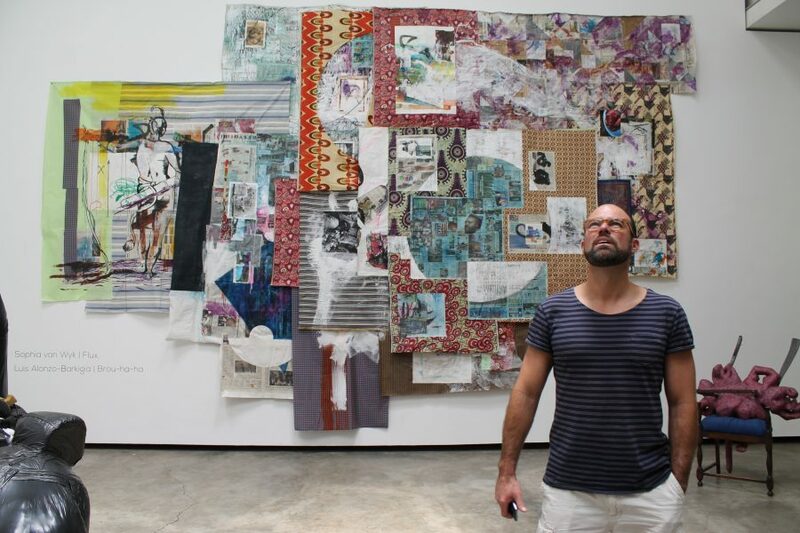 Alonzo-Barkigia in front of his giant collage and ink piece, Untitled (2015) (vertical work). 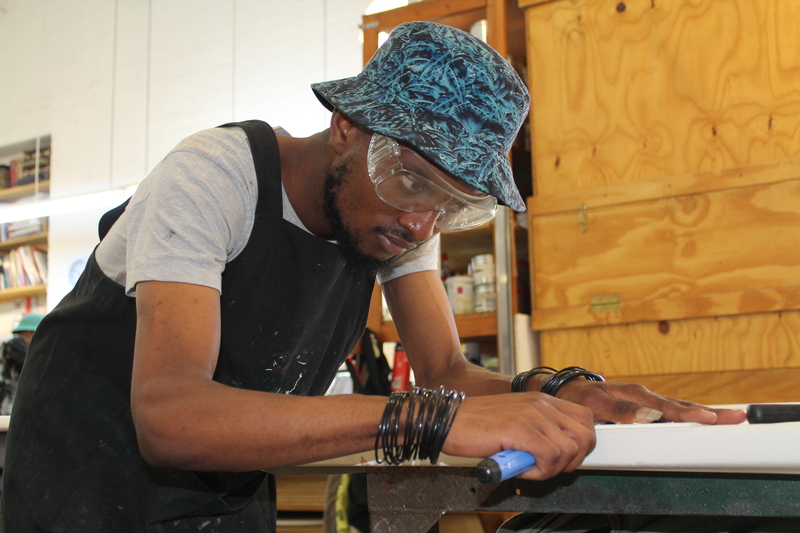 Sophia van Wyk’s sculptures can be seen in the background. Each of Alonzo-Barkigia’s works suggest a playful approach to composition and mark-making. The title – Brou-ha-ha – aptly means “an episode involving excitement, confusion, turmoil, etc., especially a broil over a minor or ridiculous cause”. For a particular work, Alonzo-Barkigia describes dipping a rag in Indian ink which he then splattered across an intricate collage at which stage he decided the work was done. As an abstract and viscerally gestural artist, Alonzo-Barkigia is conscious of the dangers of becoming overly precious about his work. “If I sense that is starting to happen”, he says, “I deliberately mess up the work. Then, I enjoy working with and through the consequences”. 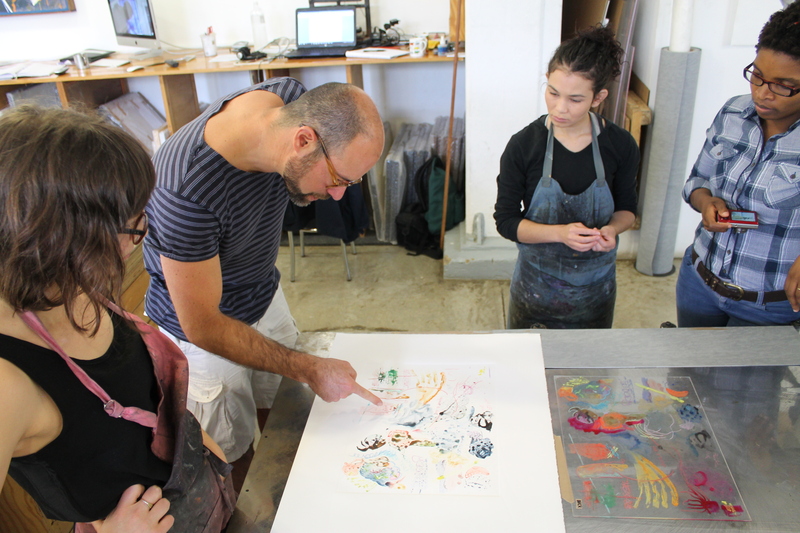 In the backdrop to the workshop buzz, Martin Motha is helping Jillian edition the last two prints from Stephen Hobbs’s series of four etchings, “Buildings, bombs, bunkers and clouds”. He is editioning Pillbox and Dazzle Cloud. Martin carefully lifts the paper after putting Pillbox through the press. Crisp results: another edition of Pillbox, ready for flattening. 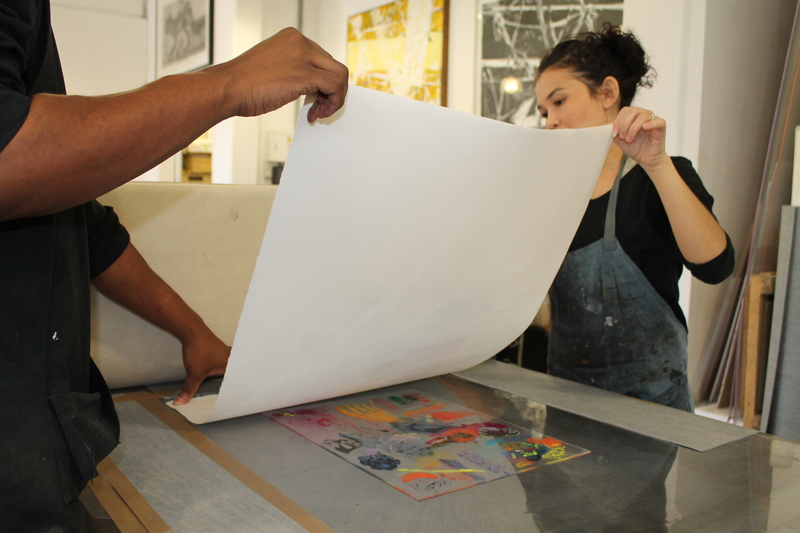 Jillian assists with the alignment of the paper for Dazzle Cloud. Watch this space for upcoming posts on Hobbs’s dazzling print suite, and the fascinating backstory for each one, as well as a follow-up with Alonzo-Barkigia on the other end of his epic South African adventure with a preview of his creative results.